I thought about calling this post "If All Your Friends Jumped Off Another Bridge...". 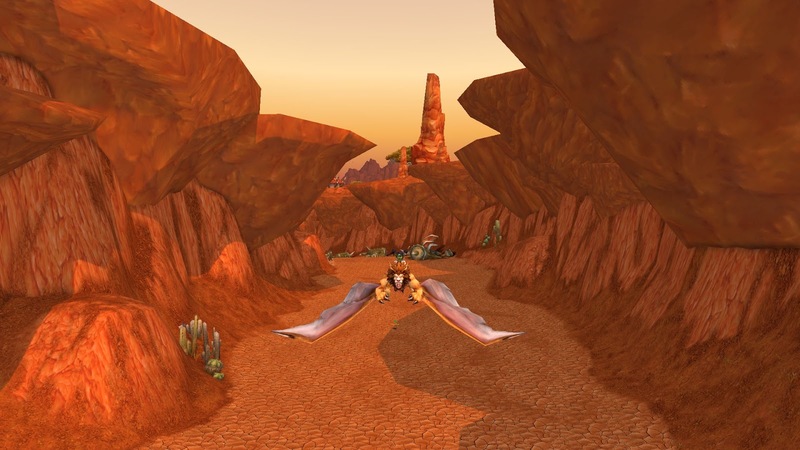 It's been a long time since I last played World of Warcraft but today I patched up and logged in again, all because every blogger in blogdom is doing the same. Actually, why stop there? All I ever saw of Warlords of Draenor was a handful of starter quests and maybe two percent of the first zone. Never even got a glimpse of my Garrison. Mists of Pandaria? I have a level four panda somewhere, I think. It's usually relatively simple to return to WoW. Not as easy as coming back to GW2, which is virtually seamless, but not too annoying. This time was no different although there were a few hiccups. First there was a Battlenet update of some kind That took mere seconds. After that came a huge patch for WoW itself - over 13GB. The launcher claimed the game was "playable" almost immediately but I waited for Optimal before hitting Play. That took me straight into one of Blizzard's epic cinematics. Even with my minimal knowledge of WoW Lore I could sort of follow some of it although I have no idea of the names of any of the featured players. It was quite impressive to watch although 90% of it was just sound effects and explosions. It occurred to me after a while that these cinematics are what two five-year olds see in their heads when they smash their plastic action figures together and shout at each other. The parts where someone yells "For the Horde!" and "For the Alliance!" really bring that home. Once the excitement died down it was on to a list of servers. Quite a few of them were Offline including, naturally, the one on which most of my characters sleep. Rather than wait for whatever was going on to be fixed I logged on someone on a server that was working. That's how it's meant to look. It turned out to be a Level 1 Dwarf I'd never played (clearly, what with him being Level 1 and all...). The game treated me to another cinematic, this time just a fly-by using existing assets with a voiceover, something about some political intrigue in Ironforge. I'm guessing it had something to do with the new Dwarven racial option, the Dark Iron mob, who were enemies last I remember but who seem to have been brought into the fold at least somewhat. I had no wish to play yet another dwarf so all I did with this one was use him to get my Add Ons working. Not that I use many. 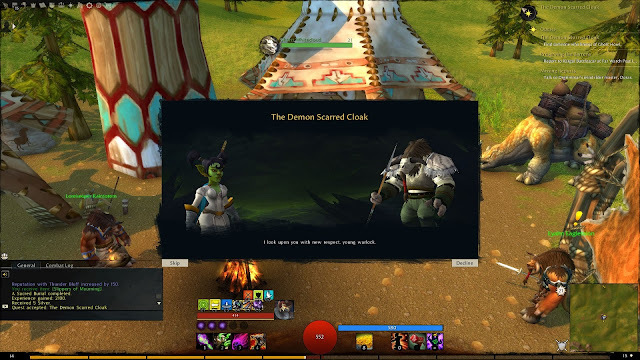 The only one flagged as out of date was the GW2 UI mod, without which I can no longer imagine playing WoW at all. (Okay, I guess I'd acclimatize if I had to but it really is so much better...). That worked flawlessly, almost instantly. I dropped the dwarf and checked to see if my regular server was back up. 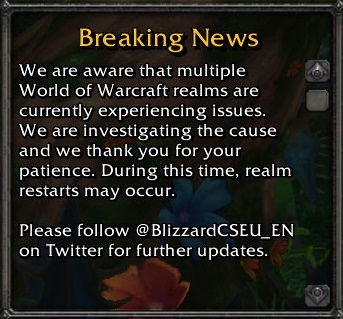 It wasn't but at least now there was a pop-up saying Blizzard was doing something about it. He's small but he packs a punch! And so do I.
I still wanted to have a run around, get back in the Azeroth groove, so I swapped to my old Free to Play account. I made it before the current version of F2P, the one that lets you play any character up to level 20. Remarkably I was able to find the old log-in details. Before I could reacquaint myself with my old friends I had to reassure Blizzard I wasn't being hacked by replying to an email; before I could do that, I had to reassure my email provider I was who I said I was. These things happen when you go a few years between log-ins. I'm just happy any of it still works. Finally I was able to log in my good old Goblin Warlock. She's a great character. 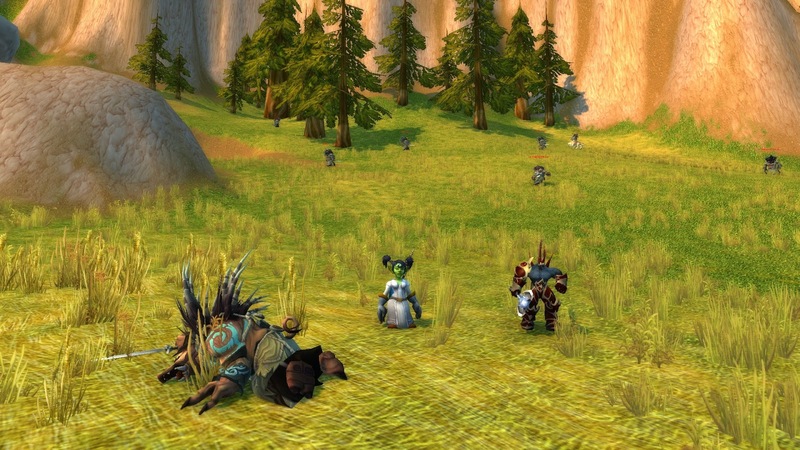 I took her all through the extremely detailed and enjoyable Goblin starter zones and blogged about it way back when. 2013 in fact. Five years ago. Blimey, Charlie! For some reason she was in the Tauren homeland of Mulgore, which is one of the most attractive parts of Azeroth. If you're going to get abandoned anywhere it's a better option than most. At level 14 I don't imagine many of the recent changes have affected her much but I did notice she only had one spell on her hot bar. "What kind of creature bore you? Was it some kind of bat?" NSFW link to source. It takes quite awhile to kill something with just the default attack and you don't get a huge amount of xp for doing it, either. Once I'd put all her spells back, time-to-kill improved although xp remained charmingly sparse. I seem to remember there was a time when leveling in the teens was so ridiculously fast it made the whole thing feel pointless. This time, even when I started doing some quests, the pace felt reasonable. Still brisk enough at maybe forty-five minutes to finish level 14 but not so speedy I felt disconnected. I'm not sure if the basic spells have changed. I was using Demonology and summoning imps with a meteor, having my Felguard (?) to tank and throwing in some kind of demonic wolf now and then as well. It was fun. Reminded me somewhat of being a Minion Master Necromancer in GW2. There was some to and fro on the weird batwinged griffins the Horde use as air taxis. It always surprises me how much time in WoW is spent just sitting on things watching the scenery. That does feel old-fashioned. I carried on until the Warlock dinged and then I called it a day. I'm back, kind of. When my regular server recovers I'll have to decide whether or not to re-sub. I probaly will for August, if for no other reason than it'll give me something to post about for Blaugust. "It occurred to me after a while that these cinematics are what two five-year olds see in their heads when they smash their plastic action figures together and shout at each other." I say this in all seriousness as a lifelong Warcraft fan: This is probably the best description of Warcraft lore I've ever heard. Also, I approve of your choice of female Goblin warlock. As someone who tends to dislike the smaller races, I've always made an exception for fem Goblins. They're not horrifyingly uncanny valley like the Gnomes, and their animations have so much personality. I'm usually a fan of gnomes and my second-highest level in WoW (although that's only in the 60s) is a male Gnome warlock. I became fond of him eventually but he really isn't much of a looker. I have a female gnome hunter who's quite cute but goblins definitely take the prize for small races in Azeroth. I'm not going to buy BfA and I can't imagine I'll go and do all of Legion now. What I really enjoyed last time were the pre-Legion invasions. I subbed just to do those with my higher level characters. Not sure we're getting anything like that this time around. I am quite curious about the War Mode though. Nor for leveling up, which I think is just the equivalent of running a race in the wrong kind of shoes, but for the possibility of some semi-organized mass battles in open zones.